SO OLD SO QUICK is the story of a remarkable life, told with charm, honesty and insight. It is a book about children, war, Pakeha, Maori, medicine, murder, hunting and horses by someone who first wanted to write and draw but was convinced to become a surgeon. 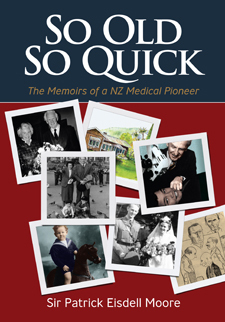 Born in 1918, son of Alice and surgeon Arthur Eisdell Moore, Patrick Eisdell Moore grew up in Auckland, attended Auckland Grammar School and graduated in medicine from Otago University in 1941. He served in World War II as medical officer with the 28th NZ (Maori) Battalion, the only Pakeha in the Maori Battalion. After the war, Sir Patrick travelled to England to obtain the Fellowship of the Royal College of Surgeons and gain practical experience in ENT surgery. He then returned to New Zealand and practised in Auckland until his retirement, pioneering community health initiatives, treatment of the deaf, cochlear implants and the establishment of Auckland's Hearing House. Published in the author's 97th year. A Rampart Publishing title. Help: Click 'Add to Cart' to purchase the printed book version. You can continuing browsing other Castle titles after adding this book to your cart. To view your cart click 'View Cart' in the top menu. Powered by PayPal (PayPal account not required for purchases). To purchase the eBook version, click on either the ePUB or Kindle icon to buy from our eBook retail partners. Copyright © 2014 Castle Publishing Ltd.